** Caution: Some images may be disturbing. It is a strange word “discover”. Yes it is a word worthy of examination through a dictionary definition. The Free Dictionary by Farlex on line defines discover as learning about something, especially by an effort. 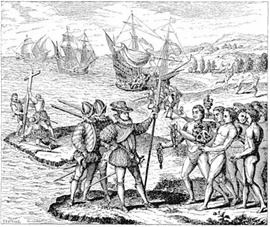 None of the definitions connect discover with possessing or ownership and yet this was the understanding of all the early immigrants arriving on the shores of North, Central and South America, to discover was to own. Let us now consider what Native Americans (American Indians) discover when those large canoes from Spain and Italy with huge white wings appear off shore. I think you can imagine the reaction by the ship Captain and his crew if a canoe full of American Indians climbed on board, stuck a spear in the deck and claimed to now be the rightful owners of the ship. The Captain may have had some doubt about his ownership claim to the ship as many of the voyages from Europe were funded by someone else like a King or Queen. The Captain’s ownership doubts or a mental mindset that he did not really own the ship may have allowed a hostile takeover by Indians without an armed conflict. In the end, the Captain and his crew would be homeless, forced to move on, and face starvation as their economic base (the ship) was no long available to them. Contemporary Natives now discover abandoned military posts and prisons like the US Army communications post near Davis, California, the NIKE missile base near Pittsburgh, PA and the infamous Alcatraz Prison in San Francisco Bay, California. These lands were not being used by the owners in any useful way. When Indians took over these land sites with little aggressive conflict, it is only a short time until American Indians were removed by police, military force or lawsuits when the government claimed to own the land Natives discovered vacant. City Indins (as we NAs would say), off the rez, begin to discover expensive cars in parking lots and along street curbs taking possession of them for use as war ponies when the cars seem to be abandoned. ownership of the atmosphere over major cities and suburbs by enterprising tribes who begin to charge those living in those areas and breathing the owned air. Expenses were minimal for the NA entrepreneurs and profits large. Some exceptions are noted as the air in many places like Los Angeles was so polluted by the dwellers it had to be weighed and detoxed before it became sellable. Natives discover cultural symbols can be sold. New marketing techniques bring additional revenue to Native peoples when they discover their cultural symbols like teepees, drums, tomahawks, feathers, war bonnets, peace pipes and even the color of their sunburned red skin can be sold to professional sport teams. Medicine persons have started a franchise business of sweat lodges, spiritual instructional use and distribution of mind altering peyote. Powwow dance studios are sprouting up all over the country as many flock to learn powwow etiquette and dance steps for grass dancing and stomping. Vision quest tours are now offered by major travel agencies. Several reservations are considering opening their communities to summer camps where families can experience Indian living without electricity, running water, and proper medical health care on a diet of commodity surplus food. Adding to the realism of reservation life, families are to bring their own booze. Driving old unsafe cars held together by bumper stickers can be added to the experience for an additional charge. Special field trips to dig up pots at Native cemeteries are also available to rez campers. For an extra fee Native American artifacts can be dug up from the graves of more recent burials as long as they leave the corpse in the ground. Indian Nation names are now available to major trucking companies on a contractual use basis. A recent tribal name was returned when a motor home company learned “Winnebago” means dirty water. An Indian reality TV show is being considered to highlight an attractive Native American reservation family as it struggles with HUD housing, 70% unemployment, substandard schools, alcohol and drug addition, Federal Indian health services (a fine example of how the government is unable to deliver on health care promises), and children having children. It should be a very successful show with all the drama possibilities. Following the examples learned from early traders who used Native alcohol addiction as a means of stealing land from the Indian Nations, modern American Indians open casinos across the country. Their casinos are raking in enormous profits from busloads of senior citizens enticed by glutinous buffets and the bright flashing lights of electronic computer based, slot machines. Many of the immigrants attending these casinos are in danger of losing their homes, jobs and families from their gambling addiction, but it is a new economic Buffalo to Native Nations. government. Indian Nations discovered the need for good lawyers during the Kinzu Dam episode where the U.S. Corps of Engineers built a dam flooding thousands of acres of Seneca land guaranteed to them in a treaty between Chief Cornplanter and President George Washington as long as the sun rises and the grass grows or in fine invisible print, “Until the Corps of Engineers decides to build a dam on Indian land.” The Sioux Nation learned of invisible fine print when their sacred Black Hills, guaranteed to them as their homeland in the Powder River Treaty, was confiscated by gold seekers supported by William Randolph Hurst and his trust buddies, and enforced by the late General or colonel Custer. Verbal promises were no longer valid. Only the words on “talking leaves” paper counted and those words only if there was an escape clause for the power brokers. Lawyers now paid with the proceeds from gambling casinos offer a new defense for Indian Nations using the legal system of the government. This effort works until the court decisions are too onerous to for the power people to bear and they change the rules for their own protection. Well it is time for me to put some of these discoveries to my own use. Gold has been discovered in a local jewelry store. There are some nice abandoned farms to discover in New York State as the farmers there can no longer afford the high taxes and flee to the southwest. There is so much to discover at the Wally-World market I may be there for quite a while. Oh yes, I did discover a bright red Corvette with many horses and as usual the seller person who did not understand what discover meant. He was not interested in a trade for corn, furs or wampum beads, but I own it anyway.